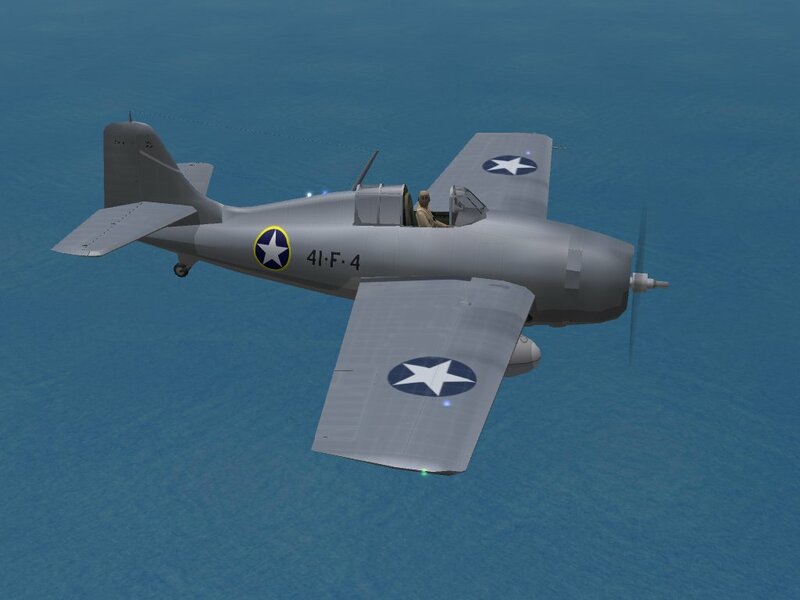 This package contains a new skin, and some minor data & cockpit ini mods for Pasko's F4F-4 "Wildcat". It is designed to TOTALLY replace the VF-41 version released several years ago. For those that haven't updated their MTO install's F4F-4, all the inis and sounds from the PTO Wildcat Upgrade are included; new data, cockpit and Main ini --so make sure you follow the instructions below!!! The cockpit ini makes use of a new WW2 N-3 gunsight tga. Like it's PTO brother, the canopy has been switched to an animation key (shift/0). The wingfold stays the same as originally issued; you use the bomb-bay control key (cntrl/O). As always, all the lights have been updated with accurate running, formation and landing lights. Also, the landing gear retraction sound is now the 'rachet' noise, as heard in the PTO upgrades. As always, it's reccomended you unzip this package to a temp folder or your desktop, or somewhere's else that's easy to find to gain access to the rest of this readme for full, detailed install instructions. Your description above says that you created templates for Pasko's Wildcat. However, it seems that it has not been uploaded. Could you share it, if possible? Thanks.